Jamie Carragher told Monday Night Football he didn't object to Jose Mourinho's tactics at Liverpool - but his approach against top-six sides could cost Manchester United the title. United faced one of last season's top six for the first time on Saturday, but the result was an uneventful 0-0 draw and they had just one shot on target in the entire match. 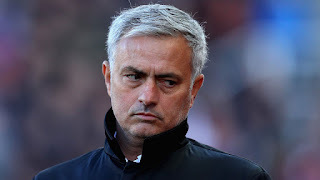 Mourinho was described as an "enemy of football" in the newspapers on Sunday morning, but Carragher refused to criticise the Manchester United boss. However, he says some harsh words may be due if United continue to play like that in big matches. Carragher said: "First of all I should say I had no problem whatsoever with what Jose Mourinho did. He's always done it and I expected it before the game. "Jurgen Klopp said afterwards that Liverpool could never play like that; well maybe his Liverpool could never play like that, but my Liverpool did and we did it plenty of times and got results on the back of it. "I think the criticism will be saved until the end of the season if results in big away games don't improve and it costs Manchester United the title." Mourinho has not won any of the last 10 matches his sides have faced away at Arsenal, Chelsea, Liverpool, Manchester City and Tottenham - and his team has not even scored in the last nine of those. And Carragher, who was joined in the MNF studio by five-time Premier League champion Peter Schmeichel, feels those damning statistics prove that his approach in big games is not working. He added: "Jose Mourinho has always been lauded - and rightly so - as the man for the big occasion, the man in a big game, a 'Mourinho masterclass' winning these games.